The Central Avenue area in South Superior, Wisconsin, was vital in the development of rail transportation throughout the Twin Ports. Largely ignored in history books, it could be argued that this was the most important railway junction in all of Duluth-Superior. While the king-pins of the big railroads contemplated the quickest route to transportation supremacy at the Head of the Lakes, the men who actually worked here were simply responsible for moving trains safely through this part of town. Theirs was an essential transportation job that had to be taken seriously. Because of the congestion and traffic density of this complex the job was a bit more complicated than it might otherwise appear. The Northern Pacific Railway (NP) developed the initial routes. Soon after, Great Northern (GN) came into town as the fledgling Eastern Railway Company of Minnesota (ERM, or Eastern for short). The first line to enter the area in 1881 was the NP’s Second Subdivision. This line was built from Carlton, Minnesota, (originally called Northern Pacific Junction) to Nettleton Avenue in Superior’s East End. Operations began on September 1, 1882. This line joined up with the NP’s First Sub-division (or Ashland Branch) at Nettleton Avenue in Superior. This marriage of the NP’s First and Second Subdivisions got it from Carlton all the way to Ashland, Wisconsin, via Central Avenue and Superior’s East End. A second line was added in 1888 when NP constructed a 4.06–mile line south out of Superior that connected with the Second Subdivision at the heart of Central Avenue. This line was built to be able to take advantage of the crossing of St. Louis Bay made possible when the first Minnesota and Wisconsin draw-bridges were built in 1885. Always planning ahead, NP built those bridges across the bay even before they had a line into this part of Superior. Their initial goal was to move traffic between Duluth and Superior and charge other lines for the use of their bridges. 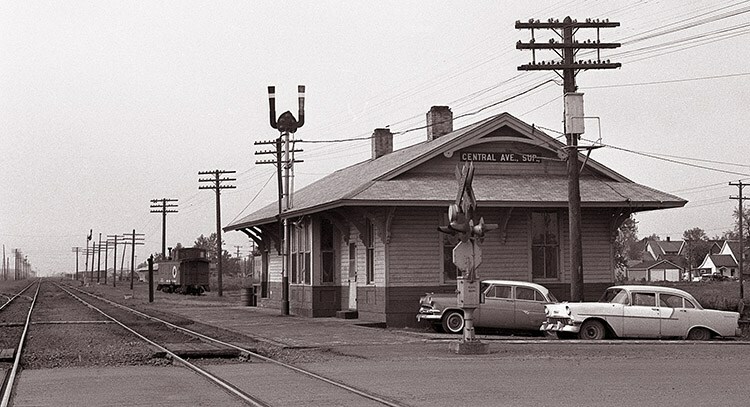 But when this new line finally connected to those bridges, a whole new route between Carlton and Duluth had been created—once again via Central Avenue. This quickly became a main route for NP and GN passenger trains to Superior Union Depot, then across the bay to Duluth Union Depot. GN entered the picture when James J. Hill’s Eastern Railway showed up to grab its share of business from the region. Incorporated on August 6, 1885, the Eastern’s original line ran from Hinckley, Minnesota, to Superior. 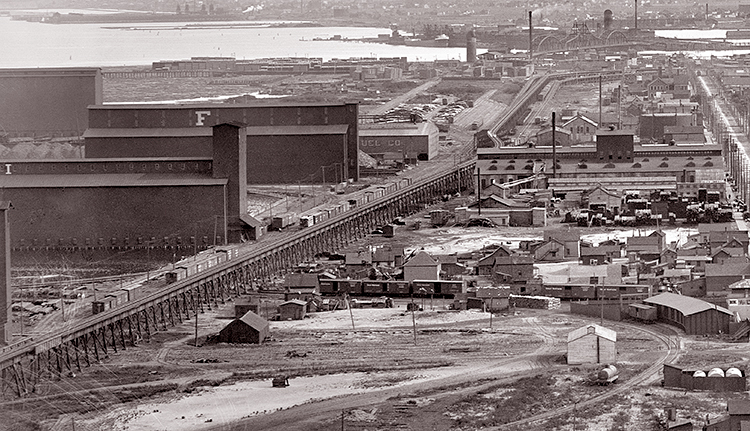 But even before it had a direct connection to Superior, the line acquired more than 400 acres of land in West Superior that it developed into large terminal facilities, yards, docks and elevators capable of holding over 3 million bushels of grain. Hill knew that NP already had the advantage in Duluth. It was his intention to thoroughly out-do NP in West Superior. The NP’s tracks ran east-west through Central Avenue while the Eastern’s ran north-south. An agreement was reached on June 1, 1889 allowing the Eastern to cross the NP’s tracks at Central Avenue. The Eastern needed this agreement in order to gain access to the huge facilities it already built in West Superior, between 28th Street and Winter Street. But there was one caveat. If NP was to agree to this deal, then Hill’s Eastern Railway would have to bear 100 percent of the costs in perpetuity of the new track connections at Central Avenue, including installation of a mechanical interlocker, construction of the interlocking tower that would house it and installation of the required signals and safety devices. The Eastern would also have to pay for the men who would operate the junction 24 hours a day, 365 days a year, as well as ongoing maintenance, emergency repairs, snow removal and construction and maintenance of five roadways adjacent to the tracks. When Hill agreed to the NP’s demands, the crossing was installed and the interlocking was made operational in February 1889. While the crossing was beneficial to Hill’s company by allowing him to access and fully develop his lands in West Superior, it was access to Duluth that Hill prized even more. Proceeds from the sale of bonds used to expand his Eastern Railway were partially based on the line making it all the way to Duluth, so Hill needed to reach the Zenith City. After more talks between the Eastern and the NP, a new agreement was reached between them on May 15, 1889, allowing the Eastern to install at Central Avenue a new connection track—not just a crossing—so that the Eastern’s passenger trains to and from St. Paul could run along the NP’s 4.06-mile line to reach Superior Union Depot, the NP’s draw-bridges across St. Louis Bay and—potentially, at least—downtown Duluth. Given the relative ease at which Hill procured this new agreement with NP, surely there had to be a fly in the ointment—and there was. The new agreement simply got the Eastern from Central Avenue across the bay and onto the very tip of Rice’s Point, which was already so congested with railroad tracks and streets that developing it any further would be difficult at best. The NP’s king-pins knew that Hill would have to craft agreements to cross each of these tracks, an expensive challenge that would take perhaps a year to accomplish. But Hill didn’t have years to wait. Never one to do anything on a small scale, he came up with an ingenious if not monumental solution to the problem. Instead of wasting time building more connections and negotiating trackage-rights deals, he quickly built a 7,540-foot-long elevated steel trestle right through the centerline of Rice’s Point. It was nicknamed the High Line although some may have called it Eastern’s eye-sore in Duluth. It ran the entire length of Rice’s Point, from the very tip at the connection with NP and almost all the way to his new freight depot, about where the tracks came back down to ground level, just short of Duluth Union Depot.